ADS pipe has been used for decades on farms, golf courses, parks and playing fields to keep surfaces dry by channeling away excess underground moisture. Homeowners find it to be an economical, easy-to install solution to all kinds of residential drainage problems: downspout run-offs, foundation and window well drains, driveway culverts, and wet spots on the lawn. ADS single-wall pipe is also used for highway edge drains and other construction applications where economy and durability are important. 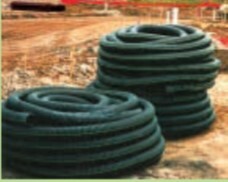 For subsurface water collection or leaching action, ADS pipe is offered with uniform slots and drilled holes. Non-perforated pipe is available when water must be moved by gravity flow from one point to another. 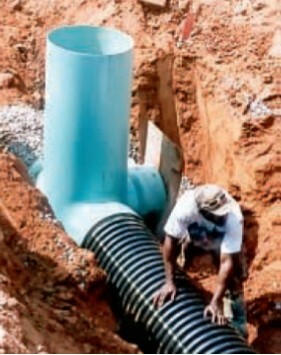 Nyloplast Engineered Surface Drainage Products represent a true innovation in storm water piping. 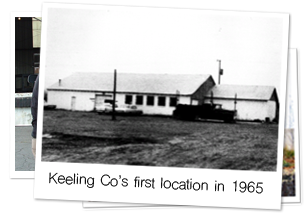 Their combination of performance–proven ductile iron grates with a rugged, heavy–duty PVC structure makes them unique in the surface drainage field. The complete product line includes inline drains, drain basins, curb inlet structures, road and highway structures and drop in grates which can be used for any plastic underground storm drain pipe systems. Because all Nyloplast engineered surface drainage products are customized to your specifications, you get a product that fits your particular application and arrives on the job site ready to install. All you do is hook it up and backfill. So labor requirements are minimal. With installation this quick, safe and simple, the cost savings are apparent and immediate. No field fabrication or other work on the job site is required. That means no grouting, no brick and mortar. Lightweight construction even eliminates the need for heavy equipment. And when you look at the total cost of material, labor, and equipment, the savings are truly huge. NDS is pleased to announce the release of our newest drainage product: the 1200NGB (Next Generation Basin). The NGB is a 12” x 12” plastic catch basin with height-adjustable outlets. This adjustability makes the NGB the perfect solution for almost any installation. The NGB saves time in two ways. First, the outlets can be adjusted to match the height of the pipe, which means fewer pipe fittings and adjustments. Second, the NGB itself is easy to adjust and install. And saving time with the NGB means quicker and more profitable installations. The NGB was developed based on contractor feedback. They wanted a catch basin that would be easier to install, saving them time and money in labor costs. More than anything else, contractors wanted the ability to vary the height of the inlet/outlets. The NGB has the adjustability contractors asked for; it is easy to install and will save time and money. 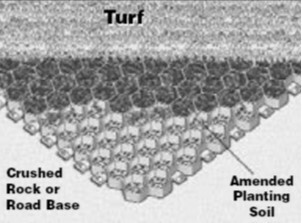 TufftrackTM Grassroad Pavers are a honeycomb cell paver product that allows light to heavy vehicular traffic to drive over turf areas. 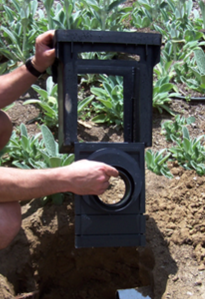 It prevents soil compaction, allowing healthy root growth. It may also be used for erosion control. A tongue and groove latching system provides quick and secure connections between the pavers without the need of additional tools or parts. Tufftrack Grassroad Pavers’ top smooth surface eliminates sharp corners, reducing liability to pedestrians. Tufftrack Grassroad Pavers are the ultimate product for promoting healthy turf in traffic areas as an alternative to aesthetically unpleasant concrete or asphalt pavements. The EZ Roll Grassroad Paver is an engineer-designed plastic grass paver that comes in pre-assembled rolls for easy installation. The EZ Roll can be used as a BMP for NPDES Phase II compliance. Products are subject to availability from our vendors and may have been replaced or updated from what is listed here. Our Golf Sales Managers and staff at local branches will be happy to assist you find replacement or updated products suited to your project’s needs.